Woohoo! The D26 Democrats have an office! 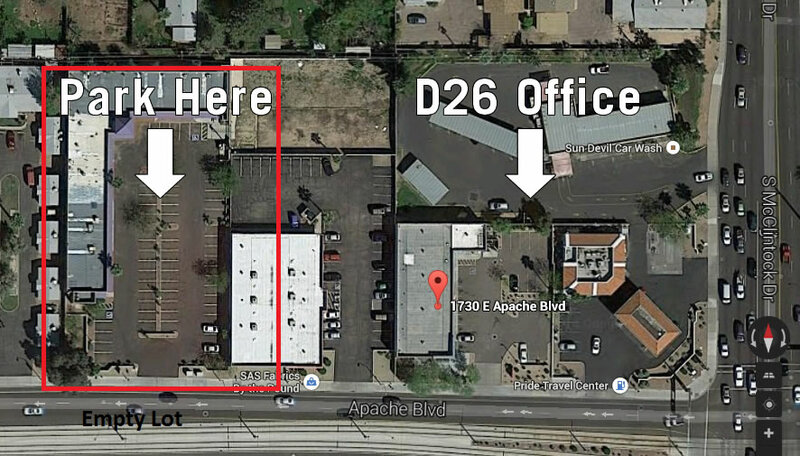 Our 2014 Field Office is on the corner of Apache Blvd and McClintock Drive in east Tempe. It’s accessible from the light rail from both Mesa and Tempe. Please join us and our candidates on Saturday, July 12th at 9:30am for a D26 Office Opening Kick-off Canvass. We will be talking to the Rising American Electorate to encourage a better Democratic turnout for the 2014 primary and general elections! 1 minute candidate speeches will begin at 12:30pm with lunch will be provided by the D26 Democrats. At 1:00pm we will have our Kick-off Phone bank, so please come for either the canvass and/or the phone bank and enjoy lunch with our Democratic candidates! **Parking at our space is limited, so please park in the completely empty lot just west of the office. See the picture below.